A recent development of antiretroviral therapy (ART) on the basis of directly acting combination chemotherapy has rendered HIV-associated incurable diseases to manageable chronic diseases. This may be heralding the advent of "AIDS-free" era in the near future. However, it does not seem likely that the battle between human versus HIV will be settled so easily. We are not able to completely eliminate HIV-infected cells in the patients irrespective of the extensive ART at present. Therefore the HIV-infected carriers have to depend on the medicines during lifetime, which may lead to increasing risks to contract various diseases with the long-term medication (bone metabolism abnormality, high blood pressure, metabolism abnormality, HIV-associated neurologic disorder, and so on). Interruption of the ART may induce recurrence of the viral replication and disease progression. The control of HIV infection is now shifting to the new stage aiming at HIV cure. Toward realization of HIV-1 cure, the existence of “reservoir cell” during the treatment and its elimination is the most considerable issue. The reservoir cell maintains the ability to continuously produce new progeny viruses due to the persistence of the viral genome in the cellular nucleus. Recently, a novel strategy so called “Shock and Kill therapy” has become under the spotlight. The therapy is based on the concept that (i) transcription activation of HIV in the reservoir cell by latency reversing agents (LRA), which is followed by (ii) removal of the reservoir by HIV-specific cytotoxic T lymphocytes (or possibly spontaneous induction of apoptosis by the viral proteins) and also (iii) inhibition of further spreading of the viral infection by the ART. A large number of new LRA including HDACi (Histone deacetylase inhibitor) and PKC (protein kinase C) activator has been under investigation. Whether HIV would be efficiently activated in the reservoir cell by LRA may determine the feasibility of HIV cure by the novel therapy. The most difficult obstacle for clinical application of the therapy toward HIV cure is how we should evaluate the efficacy and safety. An intervention examination in HIV elite controllers who exhibit undetected levels of plasma viral loads and healthy immunological status without ART is ideal for the evaluation of LRA the efficacy and safety, however it is practically too risky for the ones to conduct. Therefore, HIV controllers whose plasma viral loads decrease lower than detection limit by the ART may be considered as subjects of the intervention trial. In this situation, even if HIV could be reactivated from the reservoir by LRA, it may be very difficult to evaluate the virus inducibility due to the presence of ART. Furthermore, it is so hard to compare the efficacy and safety of different LRA and also to optimize the protocol of the therapy. 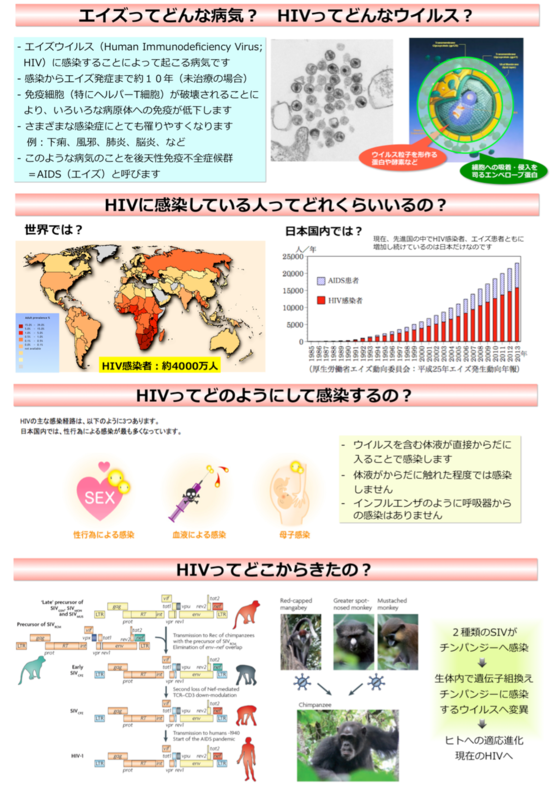 In order to overcome these issues, preclinical study by using appropriate animal models is highly recommended prior to the clinical study for HIV cure. 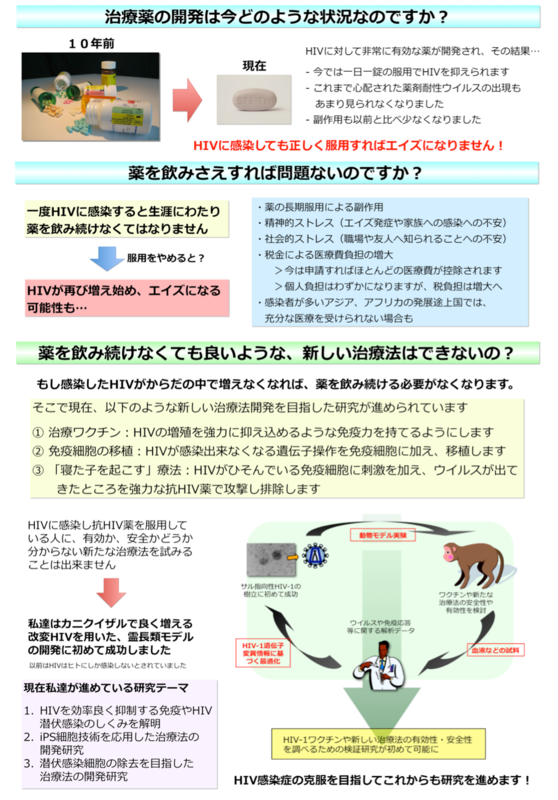 In our study team, we have recently established a novel non-human primate model of HIV infection using "macaque-tropic HIV-1 (HIV-1mt)" which efficiently replicates in cynomolgus macaques. Surprisingly, HIV-1mt constantly leads to latent infection state after the acute phase of efficient viral growth in the experimentally HIV-infected macaques. During the latent phase, antivirus immunity appears to control HIV-1 efficiently under detection limits more than two years, and administration of immunosuppressive agents leads to reactivation and production of HIV, suggesting the maintenance of the viral reservoir in the macaques. Our preliminary data indicate that this nonhuman primate model is comparable to the elite controllers and thus most suitable for the preclinical study for HIV-1 cure as well as basic study for detailed characterization of the viral reservoir including the mechanism of the maintenance, immunological background, localization in the lymphoid tissues, and clonality of the reservoir. We hope that our study will finally contribute to the clinical application of the therapeutics for HIV cure.